There are currently 0 users and 151 guests online. Created because of the annoyance the Icelandic volcano caused me earlier this year. Fortunately the volcano stopped before I had to fly out of the country this Summer. 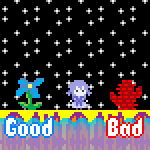 Anyway, it's a 2 player game. Pick your side, Iceland or Volcano and mash the appropriate button shown underneath the pictures to charge up attacks. 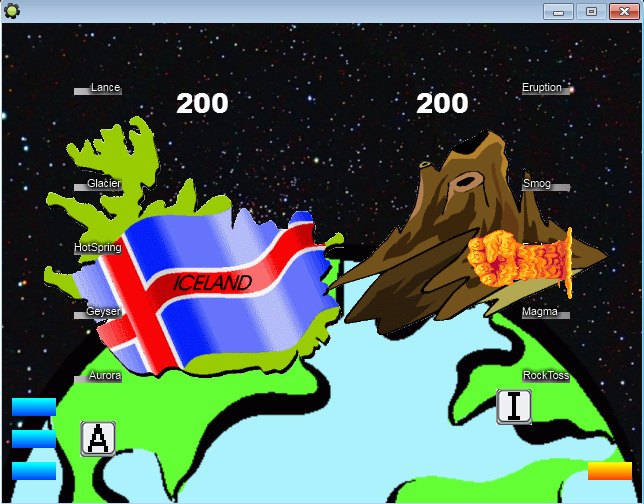 Use Q and O to fire attacks for Iceland and Volcano respectively. Volcano does more damage and can use Smog to hide Iceland's input buttons but Iceland can heal itself. What is an issue is I'm only one person and this looks like such a charming 2 player game. I'm only one G. Cut me in half and i'll be a semi loop and a t maybe, i don't know, it wouldn't look good. Who knows? I'm not really sure, but the thumbnail being differnet from the screenshot is a plus in itself. adding the volcano and iceland animation, really cool. I tried playing anyway, potential compatibility issues? nothing registered so i tried MASHING KEYS DOWN. Anyway, nice work and a good look, I hope to see more some time.